The Tony Award-winning musical “Fun Home” is based on a graphic memoir by Alison Bechdel. Cartoonist and memoirist Alison Bechdel spent years in therapy trying to exorcize the skeletons in her family closet. She grew up in the hamlet of Beech Creek, Pa., current population 703. Her father was a popular high school English teacher who restored old houses and ran a family-owned funeral home on the side. Her mother was a teacher who moonlighted as an actress. The public face of the family was just as squeaky clean: three kids, solid community members, buckets of artistic talent. But beneath the surface, the clan harbored secrets that Bechdel didn’t grasp growing up. That disjuncture inspired Bechdel as an adult. She recounted the family story in her 2006 graphic memoir, “Fun Home,” which was a stunning crossover success. The memoir was adapted into a musical, earning five Tony Awards in 2015, including Best Musical. The national tour comes to the Boston Opera House on Tuesday and runs through Oct. 29. At first glance, the material doesn’t seem like that of your typical musical comedy. The character of Alison came out as a lesbian at 19, only to have her mother reveal that her father was a repressed homosexual who’d had affairs with other men and his male students and almost went to jail. A few months later, her father committed suicide by walking in front of a Sunbeam Bread truck. That’s certainly enough material, but for a musical? The musical is bookended by images of the adult Alison writing her story. 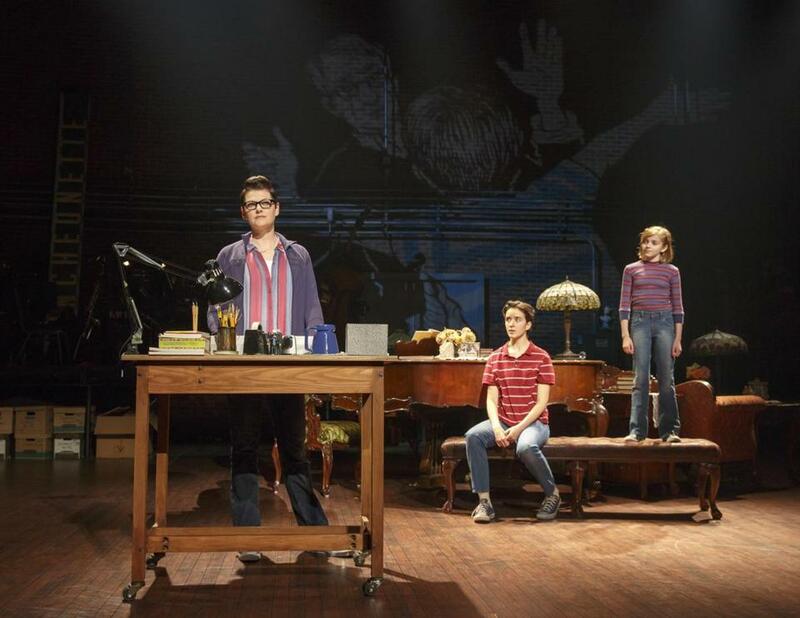 “There is no ‘Fun Home’ without that voice of the adult asking questions and interrogating what she is looking at,” Kron says. Bechdel helped provide background and gave Kron her childhood journals. And she asked for only one change. Kron had written that her father’s precious William Morris wallpaper wasn’t the real thing, but it was. The change was made. “It was really important to him,” Bechdel says. The musical revolves around the adult Alison coming to terms with her father’s actions. Bechdel didn’t know about his secret life until her mother revealed it, including details about her father’s affair with her beloved baby sitter, Roy. “I was just gob-smacked,’’ she says. “My entire childhood was something other than what I had thought. Everything was turned upside down.” Her father was trapped, she says, in a time when he had to live a lie. In her memoir she writes, “I’d been upstaged, demoted from protagonist in my own drama to comic relief in my parents’ tragedy.” Not anymore. The character of Alison was the first lesbian protagonist on Broadway. Her first influence was Mad Magazine, and she later admired the work of R. Crumb and Art Spiegelman, whose graphic novel “Maus” made her realize the potential of the genre. The artist got her start in the early ’80s with the comic strip “Dykes to Watch Out For,” where she first introduced what has come to be known as the “Bechdel Test,” based on an idea coined by her friend Liz Wallace. A work of fiction doesn’t pass unless it features two women talking about something other than a man. The reception was friendly and supportive. And she and the original Broadway cast took a field trip to the family home, now a vacation rental. “I laid my ghosts to rest when I wrote the book,” she says. Some of her father’s original restorations are still there, including the beloved William Morris wallpaper. “It was much nicer when we lived there, though. It has gotten a little tacky.” Her home in Vermont, which she shares with her wife, Holly Rae Taylor, is the antithesis of the house where she was raised. It’s small, unadorned, with Ikea furniture and metal filing cabinets. She does wish that her parents could see the musical, because it might have been able to heal their scars. Of course, that’s impossible. There would be no play, no memoir, if her father had lived. But has she healed? Twice over. “I thought I had worked it all out in the book,’’ she says. “But seeing this play has had a whole separate cathartic effect.” The skeletons, no doubt, are out of the closet.